A good basketball shooter is believed to have a hot hand. And a gambler often makes bets based on what he sees the frequency of blacks and that of reds. The bet is that if there are more reds than blacks in the first round, then there will be more blacks in the next round. But instinct is not always reliable. In fact, scoring the first time doesn’t mean you will score the second time. And there may be only a small chance that you will see more blacks in the next gambling round. Both the “hot-hand effect” and “gambler’s fallacy” stem from psychology. A team of four scholars from Nanjing University, Fudan University and Tsinghua University, including Shu Lin, Qiao Yu, Zhengyu Tang and Jian Zhou, used a psychological experiment to analyze how individual investors in China use historical stock movements to form their expectations for future stock prices. According to their article published in Economic Research in August 2006, “gambler’s fallacy” tends to be more dominating than the “hot-hand effect” among well-educated investors. In other words, investors are more willing to believe that a stock will fall after a long rise, and will rise after a long fall. Based on this theory, the research group believes that given the long bear market in China, well-educated investors harbor the basic psychological incentive to forecast a rebound in the market. A total of 285 people participated in this program, including MBA students at Fudan University, accountants and others with working experiences ranging from four to 20 years. “They, of course, can’t represent all of the investors,” the article says of the participants. The experiment was carried out through questionnaires. First, it assumes that each participant will use the 100,000 yuan he or she won from the lottery to invest in the stock market. They are presented with two stocks with almost identical fundamentals. The only difference is that one stock has been on the rise while the other has been on the slide – for a period of time which consists of three months, six months, nine months and 12 months. 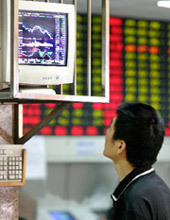 Each participant is given a timeframe and asked to pick from five choices: “buy the appreciating stock,” “inclined to buy the appreciating stock,” “indifferent,” “inclined to buy the falling stock” and “buy the falling stock.” Then, each participant decides how to invest the 100,000 yuan between the two stocks. Secondly, the researchers turn their attention to the participants’ selling decisions. They assume that each participant holds a stock with a market value of 40,000 yuan and now needs to cash in 10,000 yuan to buy a computer. Each of them will first choose “inclined to sell the appreciating stock” or “inclined to sell the falling stock” and then decide how much to sell on each stock. Finally, participants are required to forecast each stock’s movement in the second month. The researchers eliminate any inconsistent performers. For example, if a participant opts “to buy the appreciating stock” but instead spends more money on the falling stock, that questionnaire will be deemed invalid. In addition, if a participant proves to have no knowledge about the stock market, that questionnaire is eliminated, too. In the end, a total of 135 questionnaires were identified by the researchers as valid. They included 70 male participants, and 65 female participants, with an average age of 28.5 years. Their knowledge about the stock market varied significantly. But the effect of gambler’s fallacy depends on investors’ knowledge about the stock market, investment experience, ages and even gender, the article says. The more an investor knows about the market, the less likely that this investor will sell the stock after a period of continuous appreciation. And the older the investor is, the more he or she knows about the market. In terms of gender difference, a female investor is more likely to sell than a male investor after a period of continuous appreciation, while a male investor is more likely to sell after a period of continuous depreciation. What’s most interesting is the amount of time those participants choose to hold a stock. Whenever a stock goes up or down continuously, the length of time they hold the stock is on average very short, ranging between 2.9 and 5.7 months. In addition, they hold the stock longer if it has been on the decline. The researchers believe that the first observation proves the short-term mentality among Chinese investors, while the second proves the so-called disposition effect. In other words, when you sell the stock for a profit, you wonder if the profit would be even bigger had you chosen to sell it later. And when you are losing, you wonder if you should have gotten rid of the stock earlier. This kind of disposition effect is more evident among women and among those who lack investment experience and knowledge about the market. One of the goals the researchers hope to accomplish is to demonstrate the roles that both the “hot-hand effect” and “gambler’s fallacy” play in terms of affecting investors’ behavior at a time when share prices keep going up or down. The results show that gambler’s fallacy remains more evident among Chinese investors than the hot-hand effect. In other words, investors tend to believe that share prices are bound to reverse their direction as time goes on. Then, why would “gambler’s fallacy” play such a dominating role? “It’s probably because Chinese investors view stock movements as something that is objective and out of their control,” the researchers argue. When the stock price is on the rise, investors often are eager to cash in. And when the price is declining, they tend to keep holding the stock, hoping for a rebound. The researchers found that investors tend to hold depreciating stocks longer than they do appreciating stocks. In addition, the greater the decline, the longer investors are likely to hold the stock. On average, investors held for 4.8 months a stock that has seen its price falling for three months, for 5.8 months a stock that has been declining for six months, and for as long as seven months a stock that has been on the decline for a year. The researchers believe that gambler’s fallacy stems from the so-called “representative heuristic.” Or rather, it’s a firm belief in people’s minds that changes have to take place after a while. It is this kind of mentality that gives rise to gambler’s fallacy. In addition, the researchers argue that gambler’s fallacy could lead investors to buy or sell the same stock at the same time, resulting in herd behavior. But how can you explain the persistent bear market in China? The researchers think that three factors have worked to weaken the impact of gambler’s fallacy. First, this study is aimed at individual investors, not those institutional ones who tend to be more rational. Secondly, the participants in the study are better educated than others in the market, and those under-educated investors tend to make a lot of “irrational noise,” which then undermines the impact of gambler’s fallacy. Finally, the study doesn’t take into account external factors such as false market information, the low quality of listed companies and the changes in public policies.